A free and open-source subtle energy technology is described that facilitates emotional and energetic healing. It accomplishes this by assisting in the reconnection and expansion of communication links. (Links that are both within the body and connecting out into the larger nature community.) The technology is in the form of a Geometric Information Field, created by images printed on ordinary paper. The primary application of the printed pages is to place them under the sleep environment where the information field facilitates reorganization and reconnection during rest. Files containing this geometry are downloadable in Adobe PDF (and PostScript source code) from links on this web site. But how can a piece of paper?? This page covers background on how the technology works and its origins. Those interested in utilizing the technology are encouraged to read some if not all of this to get a sense of what it can do. A second page covers how to setup the pages under your bed and gives the download information for the pdf's. A third page is technical information for developers who would like to modify the PostScript source file (which generates the pdf) with their own custom symbology to test and develop new connection facilitation capabilities. We will likely also setup a Google or Yahoo group for sharing of tips and uploading new geometries. If you click the image of the Alex Gray painting above, you can see both the web of light/communications, and spheres of light at the nodal points. This closely corresponds to the Jeweled Net of Indra idea. Frontier scientists, such as Bernard Haisch and Hal Putoff, show that all space and matter is pervaded by a zero point quantum vacuum field (a plenum or energy channel) that can act as both a communications grid and may be the source of energy powering the very atoms themselves. Professor William Tiller of Stanford University and former chairman of the Department of Material Sciences, has been involved in subtle energy research for decades. Tiller Foundation His model of reality posits that there are multiple dimensions beyond the three dimensional reality we are familiar with. Our 3D space (4D including time), he calls D-space, or Direct Space. There is another space however, he calls R-space, or Reciprocal Space (or inverse space) which is a domain of frequency. R-space is basically the Fourier Transform (frequency map) of D-space. 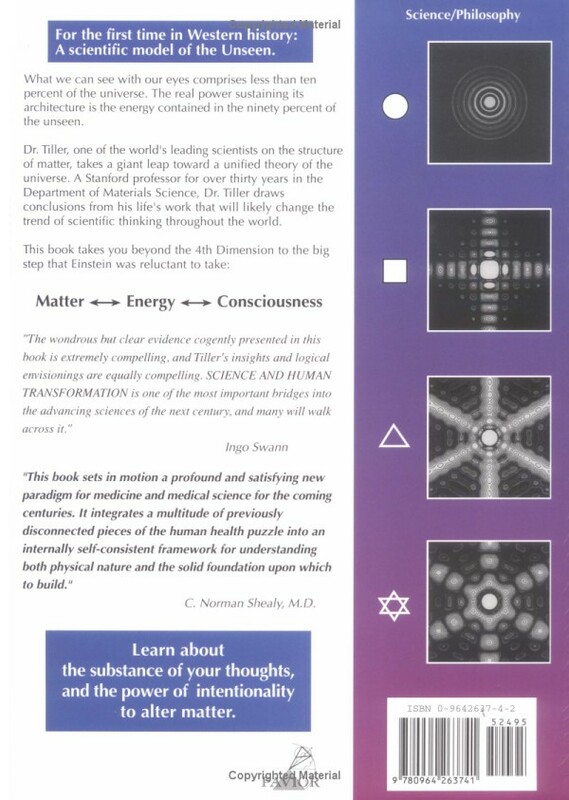 The cover of his book, Science and Human Transformation, shows that a simple triangle in D-space, can radiate out information patterns strongly in a hexagonal pattern in R-space. On the back cover of the book, some other D-space and R-space radiation patterns are shown. 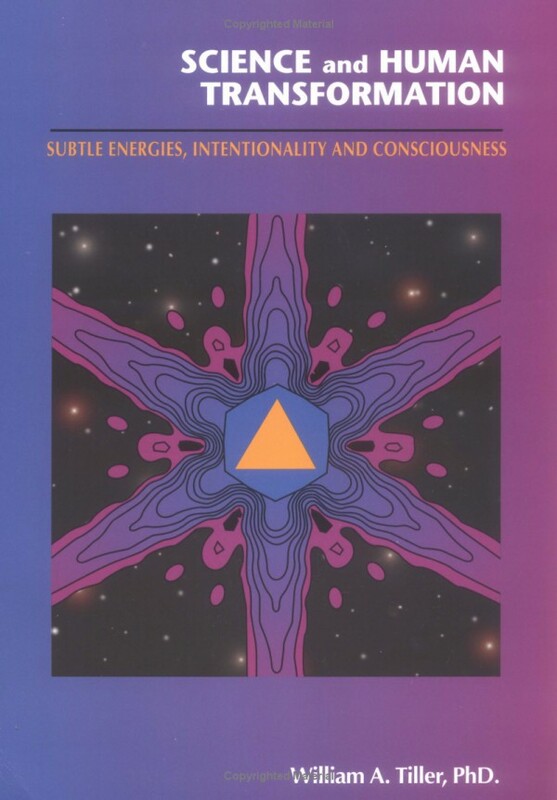 The front cover of the book shows complementary information maps for an object perceived as a triangle (center, orange) at the direct space level of reality (our conventional 4-space) and perceived as an intensity distribution of waves (from center to edges, blues and violets) at the frequency space level of etheric reality. At present, quantum mechanics empirically maps these two conjugate information domains into a single 4-space description of nature that exhibits wave-particle duality. The solid triangle shown on the front cover of this book yields an inverse space pattern with 6-fold arms extending towards infinite frequency. The intensity profile along one of these arms in this domain falls off continuously, without any discontinuities, as one goes to higher frequencies. Thus one can perhaps look at these arms as some type of energy conduits from the higher subtle domains to the lower frequency regions and, from there, to any humans located in the room. We can infer from these images that various shapes can act as transmitters and conduits of subtle energy information. Further illustrations inside the book show that arrays of shapes (a figure repeated in the horizontal and vertical directions) can have even stronger patterns. This is because repeated shapes translate into a frequency representation in R-space. The Flower of Life has represented important meaning to many people throughout history. It can be found in the temples, art, and manuscripts of cultures from all over the world. The following are some of the locations in which the Flower of Life symbol has been sighted: Egypt, Hungary, Israel, China, Japan, India, Turkey, Spain, Austria, Italy, Morocco, Lebanon, Peru, and Mexico. Note that the node points in this geometry are in a triangular tiling pattern, but each triangle's points are interconnected by circle segments, not straight lines. Thus the three sides of each triangle can be imagined to be composed of eliptical "flower petals". So in this interlocking web of node points, we see the basic Jeweled Net of Indra concept. Notice that the node points are not dotted or emphasized in this version, they are simply line intersections of the circles. I heard about Cory Herter's geometry technology in December of 2007 from a friend. Curious if this actually worked, I found a review article of his previous generation geometries (Perfect Wave Programmers) at [link]. I printed off a couple dozen copies of the jpeg and placed them under my bed. Was I impressed! I would wake up at night with emotional releases and dreams of long stuck or buried material I had forgotten about. And these releases were increasing chi flow. It was obviously having a strong effect, even with the low res xerox copies I was using. 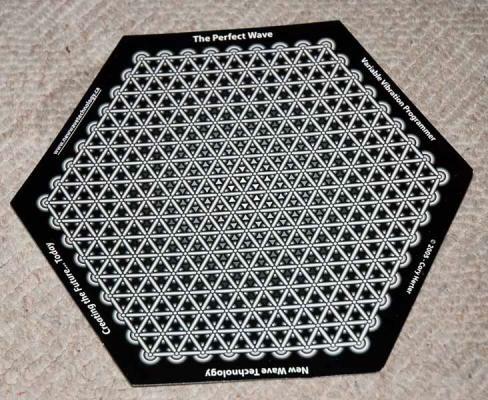 If you look at this geometry, you will see essentially the Flower of Life triangle grid, but this time with straight lines connecting the triangles and just a hint of the circular flower of life 'petals' remaining (via a slight roundness added to the sides of the straight lines). The triangle corner 'node' points are also emphasized with dots. Cory Herter was 10 years old when he and his brother were involved in a very serious automobile accident. It left both of them with brain and neurological damage, his brother more seriously with paralysis. Cory began having near-death experiences, hundreds of them during the ten or more years of his recovery. The healing of the neurons and interconnections in his brain seemed to go through phases of dissolution, reorganization and expansion. Each dissolution phase was traumatic and essentially a mini-death experience. In these repeated encounters he became aware of guides and councilors that were working with him. Giving him help and even suggesting approaches to assist his own healing and that of his brother. They did a lot of experimentation with geometries, color, sound, flower essences and other vibrational modalities. Cory found that the "field strength" emitted from the geometry, increased with the number of copies made of the image. This is an astonishing discovery when you think about it, but it ties in closely with what Tiller is saying about each shape or figure being a broadcaster of etheric energy. So increasing the number of transmitting antennas by expanding the grid, increases the field "strength" of the etheric information generated. But not the field radius, as we will see later. This appears to be fixed at about 8 feet maximum. He also found that the geometries have their strongest effect during sleep, if the field is setup to encompass ones bed. Since repair, reconnection and rebuilding are the nature of sleep, it can enhance these activities. In addition, Cory realized that containers of water (and even food) could be charged with the geometric intention, further increasing the efficacy of the intention transmission when that water is consumed. In his healing process, Cory was shown what he calls the "playground" (or field of all possibilities). This is exactly congruent with the Indra's Net archetype. Each grid nodepoint can be thought to represent an element or cell or part of consciousness or physiology. In our current state of human evolution, after living through thousands of years of scarcity and power based cultures, certain aspects of our personalities have been shut down. Instead of seeing the world as heart-centered, cooperative, win-win, etc., we see fear, competition (for 'limited' resources), and win-lose. With this kind of programming in our ancestral DNA and family upbringing, it's no wonder that we can become stressed, losing touch with our natural intuitions, aliveness, and connections to nature. If enough stress accumulates, mental, emotional and physical 'dis-ease' can result. Imagining a cluster of interconnected nodes/cells within the geometry network as representing our current state of expansion and evolution -- then it could be somewhat shutdown and narrow in it's scope, given the infinite horizons of the cosmic playground that are possible. The geometric archetype of Indra's Net (and its full interconnectivity) can facilitate expanding the dimensions of the current consciousness 'cluster'. An acronym for this process might be "HERE", Healing and Evolution via Reconnection and Expansion. The expansion is done by growing new connections from the edges of the known, into parts of self yet to be explored. At first in what could be considered mostly a 'healing' phase, the new connections are really 'reconnections', that have been broken due to turning away or pushing away from something external or internal that we chose not to experience. These reconnections operate across all physical emotional mental spiritual domains. So they actually facilitate physical repair operations in dysfunctional cells, since they are dysfunctional because of lack of communications. But simultaneously with the Healing/Reconnection operations, there is also Evolution/Expansion going on. What if?... What if we opened this door, that door, met that person, learned this skill, created that idea, became the piece in an even larger puzzle coming into place? As more and more synergy builds internally and externally, the energy and possibilities grow exponentially. Just as there are fields of electromagnetic energy (carrying information) all around us, there also appear to exist, fields of consciousness or fields of information. These latter fields can transcend space and even time, as the long history of parapsychology has shown. There have been quite a few experiments done (by the TM people and others) where a coherent, orderly field of consciousness is created -- and this then has measurable effects on crime rate, accidents (an indicator of stress), etc. When the consciousness field is shut down the effects disappear. So this is real. Information fields can operate in a similar way, many agricultural firms have used radionics (intention transmission) technology to increase crop yields or counteract stressors. Tiller's experiments with IIED's (Intention Imprinted Electronic Devices) show that such broadcast intention can even change the pH of water, in controlled and replicated experiments. This is thought to happen by the "conditioning of space" in the area of transmission to operate at a higher degree of order or coherence. The geometry is operating analogously to the TM meditators who created the coherent orderly field of consciousness influencing the surrounding environment. The very high degree of orderliness and coherence in the patterns is radiating a strong coherence field with the Indra Net intention-archetype. All of these would ideally be determined by objective measurements with instruments. However as we know, there are no current instruments that can register such etheric light emissions. Elsewhere on this site we mention the utility of having some kind of consciousness-guidance system that can choose among different options, which are in our highest and best interest. And this is usually done with some type of dowsing or muscle testing. So although the scientist within us might yearn for objective measuring instruments, we make due with the best we have at present time. Our choices can also be confirmed by our direct experience of the strength of the geometric field effects, and how those are being registered by other members of the community exploring this. The purpose of this site is to facilitate healing and cooperation between mind (intellect) and heart (compassion, wisdom). Many spiritual traditions acknowledge these two dimensions of consciousness, and even have practices that develop each aspect independently. Could these geometric fields assist with that reconnection? There are many groups and individuals working in the area of heart-intelligence facilitation. A partial list is on our Links page. One interesting approach related to interconnecting consciousness parts is that of the American Zen teacher Genpo Roshi -- who has become well known for his remarkable Big Mind / Big Heart process. In this group process of Big Mind he dialogs with various subpersonalities within the psyches of the group, initially the ones that are fear based such as The Controller, The Child, The Critic. With enough evidence and assurances, these subparts can relax somewhat and allow deeper and higher parts of the personality to surface. In the end stages of the process, which lasts only an hour or so, one has accessed a very real sense of a boundless expanse of pure awareness (Big Mind) and more impressive, an embracing experience of compassion and caring, Big Heart. See our links page for a complete 1.5 hour Youtube video of a Big Mind workshop. Use of the geometric field technology enhances any of these approaches because it facilitates communications between sub-parts of the personality. So what kind of geometries and geometry features can best facilitate reconnection and opening? This question is only partially answered at this time because our user community is growing. We expect synergy to emerge as members suggest and try various symbols and features of the geometry. So far we have used two categories of geometry. 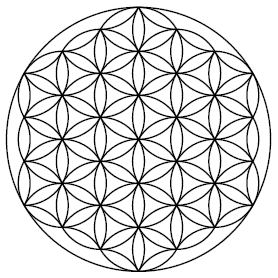 (1) the original FOL, Flower of Life interlocking circle grid. (2) triangle grids with differing images at the vertex node points. Various node point images have been experimented with: e.g. dot, heart symbol, ground symbol, and other geometric shapes with symbolic meanings. The figure on the right shows the heart triangle grid. So, maybe this is not a surprise, given our heart-intelligence bias. But other participants measuring the energetic effects subjectively have verified that the heart node-point image in the geometry is noticably stronger in effect than other triangle grids (e.g. using as a plain dot at the node points). The triangle grid without any node point images seems to be rather flat or empty in effect. So the current recommendation is to primarily use the FOL geometry as the basic grid which resonates with the Jeweled Network of Indra archetype. And then to optionally introduce some of the symbolic nodepoint, triangle grids, if desired, to add particular flavors or intentions to the emitted field. It is not recommended to use the triangle grids alone. All of the various types of geometries and images are provided with our PostScript source code file and can be modified with customizations for those who wish to experiment. The next section covers how to use and setup the geometries under your bed. The final section on source code is for those who wish to modify or generate new field patterns.